Race lovers in Co. Westmeath have the opportunity to get ‘racy’ a winning bet/streak this Friday and all in aid of the National Council for the Blind of Ireland. Don’s Bar in Moate is the venue for the event which gets underway next Friday 20th April at 8.30 pm. At just €2 per bet, an affordable night’s entertainment is on offer and all for a very good cause. 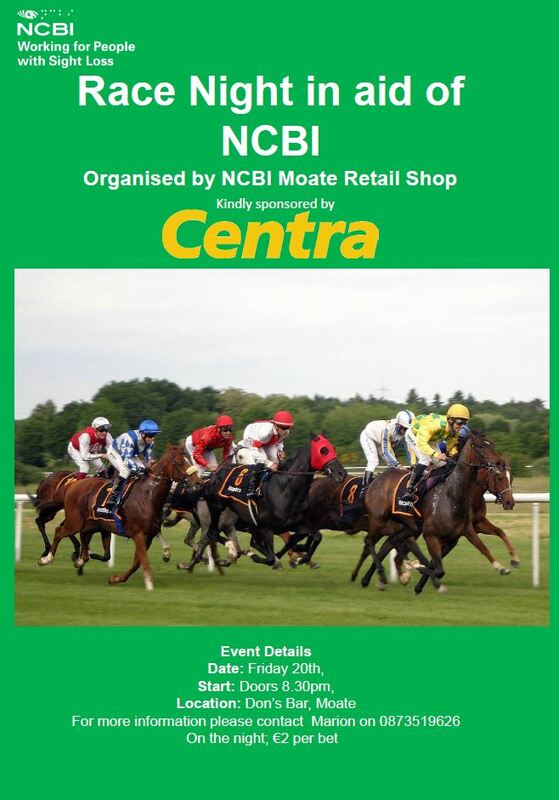 NCBI Retail Moate has worked hard to get sponsors on board and Manager Marion has succeeded in attracting a very healthy response from the local business community. Big kudos goes to Centra Moate who are the main sponsors for the night . A super night is assured, race to it!